This apartment complex is situated on 6,000 m2 of gardens in the area of Costa de Antigua, within walking distance from the beach of Caleta de Fuste. The hotel offers a large pool surrounded by sunny terraces, gym, sauna and several sports facilities. The island capital of Puerto del Rosario is 12 km away, the international airport of Fuerteventura is at a distance of 5 km. The hotel offers 90 apartaments y 53 bungalows, with well-equipped balcony. All Inclusive units have a fridge & a Kettle. Self Catering units have Kitchenette.Clients can be accommodated in Apartments or in Bungalows (except in Pool view Apartments ). Caleta de Fuste Subjects to: Purpose built and geared for pleasure and relaxation, Caleta de Fuste is still relatively new on the tourist trail. 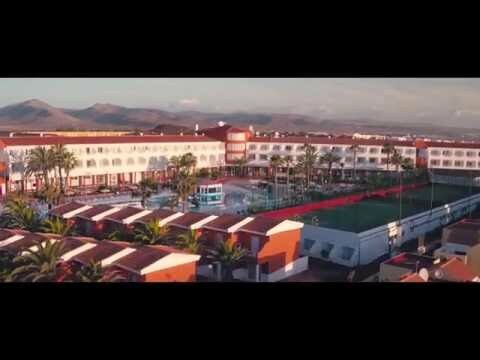 The resort is only about 20 years old and, whilst there is infrastructure, it is yet low key and all very laid back and is really quite typical of Fuerteventura's holiday resorts. Located almost halfway down the east coast of this lesser known Canary Island, the beaches are safe and the waters clean and clear as glass. Caleta (meaning "cove" in Spanish) has been created around a natural cove where the shore shelves gently. Fuerteventura holidays here, and also in the resort of Corralejo, are child friendly and the beaches are great for families where swathes of sand (although largely imported) are super soft and fine underfoot. An 18th century watchtower or "castillo" is a pretty landmark in the resort. Casual, informal and restful, Caleta de Fuste is not a hotspot for discos or wild nightlife, rather the resort caters more to family style entertainment with romantic restaurants and cosy bars. Perfect for those who enjoy dining out, there are lovely local eateries in Caleta and plenty of international establishments serving fine fare. You'll be spoiled for choice. There are no flights to Caleta de Fuste, but regular flights to Fuerteventura airport directly from Ireland ensures easy access ot the resort and ClickandGo provides good accommodation options in the area.